Many of our clients will likely tell you that at some point they wondered why we were so insistent that their small business must blog to stay current and competitive. The majority of small business owners probably wonder the exact same thing. They (business owners) feel like they have nothing to say on a blog, or that no one will care in the first place. Having a blog isn’t about making the most viral content on the internet. What I want you to understand is that blogging is the backbone of your web presence. We all typically think of social media as Facebook, Twitter, and anything else that can be “pinned”, “Liked”, or “Shared”. Blogging plays a super-important role in social media as it is often the actual media that is shared. The greatest value comes from the horsepower that it can bring to your overall site optimization and traffic. 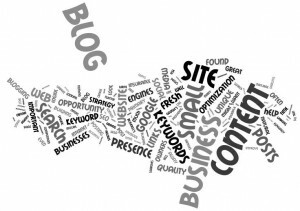 There are many sound reasons that a business should blog. Many of the benefits are quite tangible and easy to understand. Others are more esoteric in nature but no less important. Inbound links are a powerful asset to your website optimization strategy. However, there are right ways to obtain links, and there are wrong ways. It is far more important to gain a few quality links over hundreds of poor links from other websites. Natural link building occurs when another website or blog finds your article and links to it from their site. This is a powerful statement by those who care about their website, because natural links put their reputation on the line. Google and other search engines take notice, and give your site an extra brownie point. Small businesses should diversify and focus on other search engine optimization techniques as well. Achieving the natural link is often much harder than it sounds. Updating your site by consistently adding fresh content to your blog makes search engines happy and separates you from your competition. Most businesses will rarely update their site, but the truth of the matter is that Google loves fresh content. Not only will you be adding fresh content to your site, but you will be adding pages of content to your site. What you are building is a reputable body of work. Search engines are not only looking for fresh content, but they are analyzing your site to see how much unique content is there as well. As a small business it is in your best interest to add more depth to your web presence by writing unique content. Not only does Google love fresh and unique content, but it is also looking for relevant content on your site. Search engines (ALL of them, not just Google. We use Google for familiarity’s sake, when we say Google, think “All search engines”) “crawl” your website, indexing every page (including blog posts) in order to paint a picture of what your site is all about. It is important that you reinforce Google’s perception of your web presence by providing it with unique content filled with natural keyword density for your business. As they crawl your website, the search engines pick up keywords from your meta-tags, title text, links, bold words, and regular content. It is important to have a keyword strategy for each blog post before you even begin to write the content. It’s all a part of search engine optimization (SEO) Many small business owners simply lose hope because they are not writers and they have no clue how to use keywords for content marketing and SEO. All too often, we have come across abandoned blogs attached to beautiful WordPress websites. If you look back through their blog posts, you might see posts that include titles such as “Quote of the Week,” “Wordless Wednesday,” and anything else that has nothing to do with the company. This is the result of a small business hearing that a blog is important, but they have no idea how to obtain the search engine boost that they had hoped for and heard about. Blogging allows businesses the opportunity to be found for multiple levels of keyword searches. Primary keywords, or the keywords that you want to be found for above all else, can be supported with a great keyword strategy in blog posting. Along with your primary keywords, blog posts open your small business site up to long tail keyword searches, which are much more specific. For example: An insurance agency might use primary keywords such as “insurance,” “auto,” “homeowner’s”, and their physical location for their homepage. Blog posts help fill in the gaps by providing the opportunity to be found for long-tail keywords. The same insurance agency might write a post about “Lowering Homeowners Insurance Costs.” These posts are highly specific and have less competition in terms of search. This provides the business with a greater opportunity for being found on the internet. Small businesses, especially those with small sites (less than 100 pages) should be wary of posting too often. Thanks to the Google Panda updates, you should be especially careful about what and how often you blog. Overlapping and redundant articles can look bad to Google. Even posting too many times a day, despite the quality of your content, can look suspicious to Google. We believe that four times a month is the magic number. Blog posts occurring once a week are easier to manage for quality reasons as well. This allows time for quality articles to be written with great content, and quality primary and secondary keywords. The time between writing and publishing blog posts is best spent in other areas that have to do with your small business’s web presence. “Offsite” SEO needs to be assessed and considered as well. Yes, we’re talking about participation in social media. It’s important to note that Google’s most recent updates blur the lines between SEO and social media even more. This reinforces the idea that it is no longer an option for small business to ignore social media. Social media is here to stay. Cultivating relationships away from your site, through social media, will help your entire web presence in the long run. Spend time updating and making connections through Facebook, Twitter, and Google+ (Yes, your business should have a page.) These offsite activities will help improve your general web presence and they ultimately help promote your overall web presence. This is 2012 and we don’t use The Yellow Pages like we once did. We search for and find what we’re looking for on the internet. Developing a great blogging strategy will dramatically improve your small business’s web presence and will help it to be found on the internet. Don’t allow your website to just sit there accomplishing nothing. What you want is for your entire web presence to be out there working for you 24/7 and ahead of the competition 24/7, right?